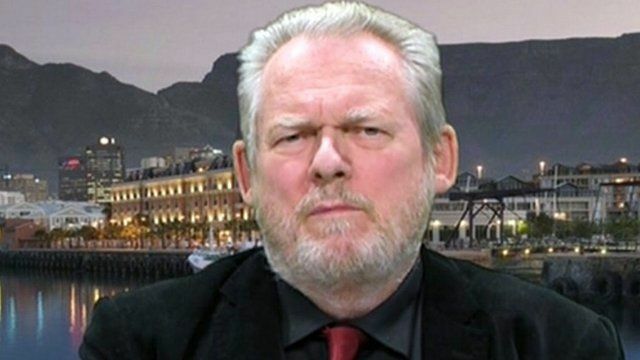 There is no legal or constitutional reason for President Jacob Zuma to leave office South Africa's Trade and Industry minister, Rob Davies, has told BBC's HARDtalk. Asked whether he felt comfortable serving a president who had "violated the constitution," Mr Davies said it was a political question. "If you look at most of the opposition parties, what they are looking at is not just the removal of President Zuma from office, they are looking for the removal of the African National Congress (ANC) from its position in government," he said. "What we have got is a functioning government that is continuing to serve the interests of the people of the country, and I'm very happy to continue to serve in that regard," he added. President Zuma has faced two court rulings against him in the last few months. South Africa's High Court ruled in April that President Zuma should be charged with corruption relating to a multi-million dollar arms deal the government negotiated in 1999. Mr Zuma has always denied the allegations. In March, the country's highest court, the Constitutional Court ruled that Mr Zuma had violated the constitution by failing to repay the government for money used on upgrading his private residence. Mr Zuma apologised to South Africans for the "frustration and confusion" caused by the scandal vowed to pay the money.